Brusatte traces the evolution of dinosaurs from their inauspicious start as small shadow dwellers—themselves the beneficiaries of a mass extinction caused by volcanic eruptions at the beginning of the Triassic period—into the dominant array of species every wide-eyed child memorizes today, T. rex, Triceratops, Brontosaurus, and more. 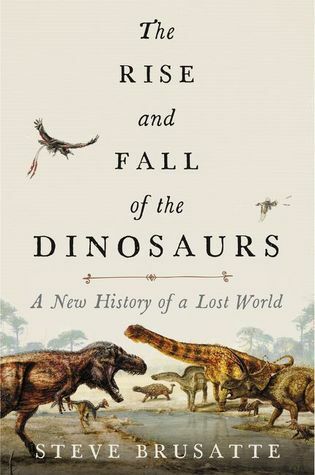 This gifted scientist and writer re-cre Brusatte traces the evolution of dinosaurs from their inauspicious start as small shadow dwellers—themselves the beneficiaries of a mass extinction caused by volcanic eruptions at the beginning of the Triassic period—into the dominant array of species every wide-eyed child memorizes today, T. rex, Triceratops, Brontosaurus, and more. This gifted scientist and writer re-creates the dinosaurs’ peak during the Jurassic and Cretaceous, when thousands of species thrived, and winged and feathered dinosaurs, the prehistoric ancestors of modern birds, emerged. The story continues to the end of the Cretaceous period, when a giant asteroid or comet struck the planet and nearly every dinosaur species (but not all) died out, in the most extraordinary extinction event in earth’s history, one full of lessons for today as we confront a “sixth extinction.” Brusatte also recalls compelling stories from his globe-trotting expeditions during one of the most exciting eras in dinosaur research—which he calls “a new golden age of discovery”—and offers thrilling accounts of some of the remarkable findings he and his colleagues have made, including primitive human-sized tyrannosaurs; monstrous carnivores even larger than T. rex; and paradigm-shifting feathered raptors from China.